These Stuffed Pizza Rolls taste just like your favorite pizza, combined into a roll and drizzled with a zesty, buttery glaze! It’s a well-known fact in my family that the hubster is a sports addict. Football, baseball, basketball, and hockey, my husband loves it all! He records various sporting events and talk shows on TV, listens to sports radio, reads ESPN magazine, checks the game scores online, and watches whatever he can to get his sport fix. If you have a question about sports, chances are the hubster knows it. His knowledge of anything related to subject continues to amaze me. I always tease him that he missed his calling in life to go into sports broadcasting. Myself, on the other hand, isn’t really into sports. I don’t really watch any type of sporting event on TV (unless it’s college basketball during the NCAA or the occasional Chicago Bulls game). But other than that, it’s a snooze fest for me. While I do enjoy going to sporting events, the rest of it isn’t as appealing as it is to my sports-loving husband. However, I love to create tasty game day snacks. I’ll take any excuse that I can to whip up something to munch on! And if I have something delicious to snack on, I can last just a little bit in front of the TV watching football. It’s all about the snacks, guys! 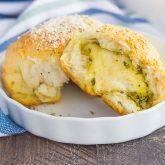 So in honor of sports fans everywhere (and those who just love a good snack), I created these easy Stuffed Pizza Rolls! These Stuffed Pizza Rolls taste just like your favorite pizza, combined into a roll and drizzled with zesty, buttery glaze. 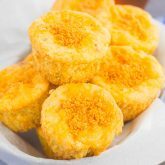 And if you’re anything like me and can’t get enough of pizza, you’re going to love these bites! And this zesty snack took just minutes to prepare! You simply flatten refrigerated biscuits, sprinkle in some mozzarella cheese and pepperoni, and then shape the dough into balls. You then brush on a delicious seasoning of butter, garlic, and Italian seasoning, and pop these cuties into the oven. 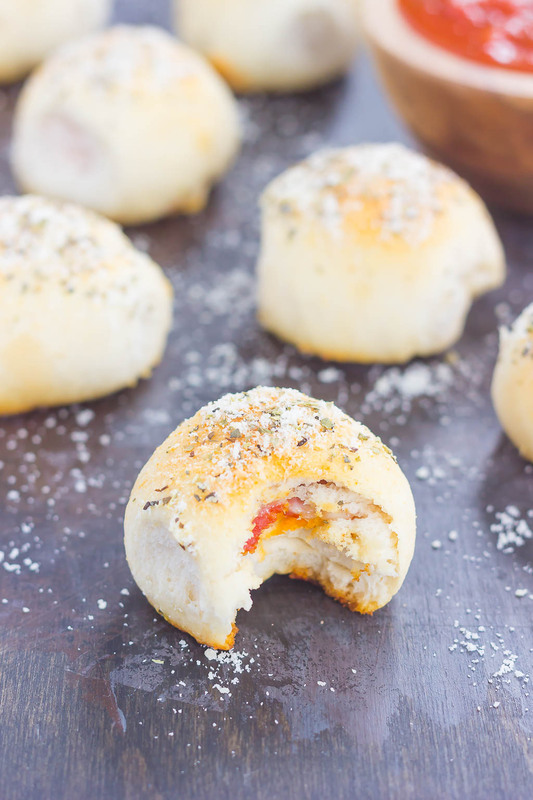 These Stuffed Pizza Rolls are the perfect game snack! 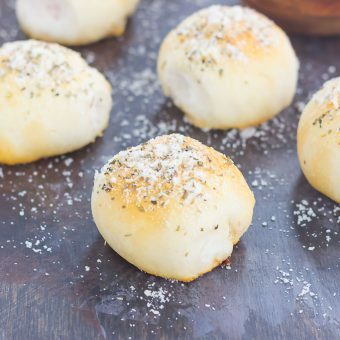 Hubster-approved, simple to make, and full of pizza flavor, you’ll be baking these bites all the time. Serve with warmed pizza sauce, and you have yourself a game day winner! Looking for more bread or roll recipes? I’ve got you covered! Preheat oven to 400F. Lightly spray a casserole dish or 9-inch pie pan with cooking spray. Set aside. Flatten each biscuit with the palm of your hand (or rolling pin). Sprinkle mozzarella cheese and pepperoni onto the center of each biscuit. Working one at a time, pinch the sides of the roll upwards to seal the dough, and then roll into a ball. Place into prepared dish. Repeat with each remaining biscuit. Combine the melted butter, Italian seasoning, and garlic powder in a small bowl. Lightly brush the butter mixture on top of each roll. Sprinkle Parmesan cheese over the tops. Bake for 10-12 minutes, or until the rolls brown slightly on top and the dough is firm. Serve with pizza sauce, if desired. This is a perfect game day snack!! All my favorite flavors rolled up in one! Fun recipe!! Um, yum. Like really a lot. Such a great idea! And it looks crazy complicated to make even though it's not. Talk about an amazing treat, even if you don't happen to be watching ESPN! I could eat pizza 24/7 and be one happy girl, so these bites definitely fit the bill! Thanks, Arpita! I love Pilsbury recipes, too! They make great easy weeknight meals or snacks. And these pizza rolls are so perfect for when you need to zone out and want something tasty to snack on! Thanks, Laura! These look like the perfect food to enjoy while I pretend to watch sports on TV. Love it, girl! Ha ha I totally pretend to watch sports, too...doesn't last very long though! :) Thanks, Liz! I love this game day snack! Eating is about the only thing I enjoy on game day. Pinning! Same with me, Jen! The snacks keep me entertained. Thanks for the pin! I love anything "pizza" and these are just perfect for me! Great for game day and so easy to make! Pinned of course! I agree, Mira! Anything with pizza is a winner in my book. Thanks so much for the kind words and pin! Yep, these are totally the perfect sports-watching snack food. And there are so many possibilities for filling these! Definitely, Kristine! 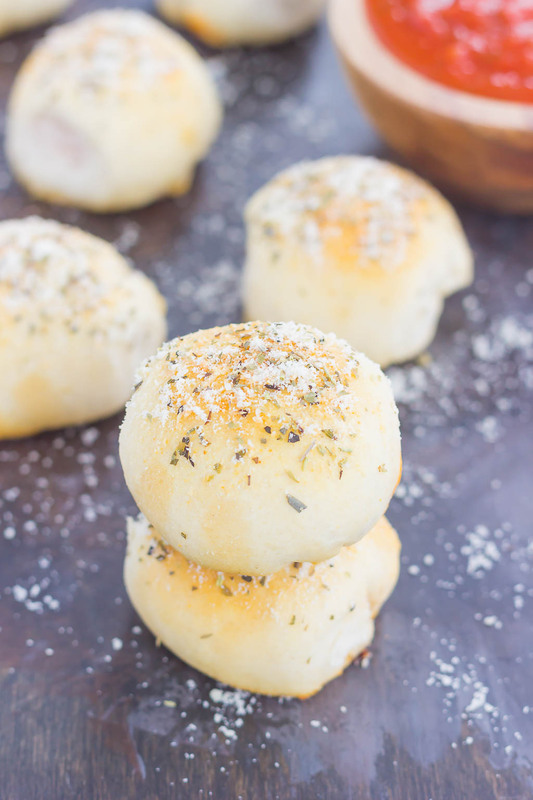 These pizza bites are so versatile to wow everyone's taste buds! Ahh, I've been seeing these stuffed pizza rolls everywhere and they look delicious! I'm thinking I need to get these healthified! HA! Looking yummy Gayle! How funny... my S.O. is the same way. He listens to EVERY radio sports talk show, all day long, records all the tv shows, etc. He's a junkie too. Our mornings getting ready for work right now are with anything Buffalo Bills in the background. Lol. I am *obsessed* with football. College and NFL. That's about it for me. I am also OBSESSED with these pizza rolls! GAH! They're beautiful, first of all, but I knooooow they are going to taste ridiculous. When I was a kid, a local place sold pepperoni balls and we all adored them, they were coveted by all. If possible, these look even better than those! Trying them for sure. Then you definitely know what I mean, Sarah! :) Thanks so much for the pizza roll love! These are so easy to make, and perfect for you on football days! Um can I come over and have one of these right now!? :D These truly look mouth watering-ly good, Gayle! These are the perfect "game" day food for sure and I love how easy these are to make :D I am like you - I am not really into sports but I'll take the snacks that come along with it any day! Thanks so much, Ceara! I would deliver if I could! :) And tasty snacks like these help me getting through any type of sporting event! Mmm, these stuffed pizza rolls look amazing! They're perfect for game day - I would totally want to hang out at the food table with a few of these instead of by the TV. I love how easy they are to whip up too :) Pinning! Those look awesome! I love pizza anything, stuffing it into bread sounds like a great idea! Thanks, Stacey! Pizza anything is my favorite, too! I'm just like you, I'm not in to sports AT ALL! Luckily for me, neither is my husband. Which is kind of funny, because his family is OBSESSED. All they do is live and breath football. It's nuts. They're always inviting us over for the game, but we really just go for the company and the food. These stuffed pizza rolls sound so good! I'm going to have to bring them next time, they'll be a huge hit! That's too funny that your husband doesn't like sports either! And I totally go to sporting get-togethera for the food and company, too. That's the best part! :) I hope you like these if you try them, Natalie! They look AMAZING! You never cease to amaze me with your seriously creative (and delicious!) ideas! Because these are rolls and not big slices, that means we can eat double the amount and it will be ok right?! :P love these stuffed pizza rolls!!! gimme gimme!!! I like your thinking, Alice! These rolls definitely mean that you can have more than one! Thanks for the kind words! I should give these Pilsbury biscuits a try! 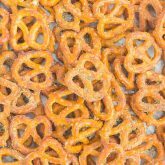 sounds like they are awesome to create quick snacks and appetizers! This is such a great idea to create pizza rolls Gayle! Thanks, Manali! I love using Pilsbury products and think you'll like it, too! I was trying to concentrate on what you were saying about sports but I have to admit, I was more interested in these amazing pizza rolls! Definitely pinning! Thanks for the kind words and pin, Ashley! Thanks, Valya! These are so easy to make and taste better than the store bought kind! I've been waiting for the recipe for these after you posted on Instagram! They look perfect for my kids to make for dinner while I relax and read a book:) I'm not into sports either, but am always looking for more game day snack ideas for my husband! Thanks for the recipe, Gayle! I want these sooooo badly! Who cares what the husband wants these are all mine!!!! My jaw is officially on the floor. Can I say yum?! Everything about this just screams comfort food. Cheesy, melty, carby awesomeness. Pinned! wow, this puts microwave pizza rolls to shame! Definitely, Caralyn! Thanks for stopping by! I have no words to describe these fluffy stuffed pizza rolls. Sport game or not, I could turn eat these every single day of the week. What a great way to change up our pizza night! Thanks so much, Jessie! 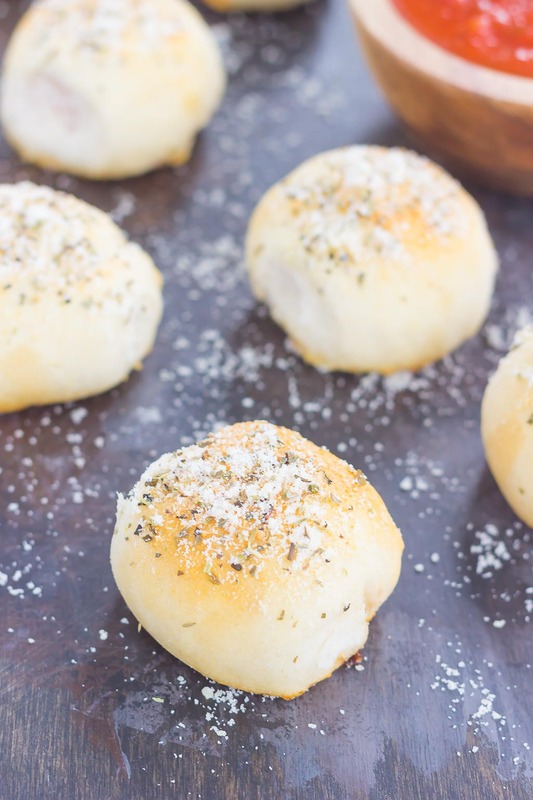 These pizza rolls are definitely a fun twist on the real thing, and so delicious to munch on! Wow your husband has THE life----sports and a wife who makes wonderful snacks. This is a creative winner. What an excellent idea. I think you are right. If your husband has a passion like that for sports----sports broadcasting would be the perfect fit. Oh my these look AMAZING Gayle!! I have such a weakness for pizza rolls, but these look way better, definitely need to make these this weekend! Pinned! Thanks for the pizza love and pin, Christina! Thanks, Alyssa! These pizza rolls definitely hit the spot! Danggg Gayle these look amazing! Haha tell your hubby that its never too late to follow your dreams!! - I wanna see his face on tv! (Although If I lived with you, my dreams would probably be in the form of leftovers the kitchen). Have a great weekend, TGIF!! Ha ha I will totally tell him that, Tash! :) Hope you have a wonderful weekend, too! 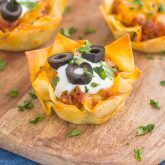 Oh these sound awesome for game day, and so easy! These are so cute! What a fun and yummy snack for game day!! Don't they Jocelyn? It'll be our little secret that these took just minutes to make! :) Thanks for the kind words! These new pictures are gorgeous, Gayle! I totally want a personal-sized pan of these all to myself! These are so cute and pretty easy to make! Can't wait to try them!